Please be sure to give the most accurate information about dog breed and temperament. If we have been given incomplete or inaccurate information, Friendly Paws Pet Resort reserves the right to deny boarding/daycare at check-in. Please indicate below the dates the vaccines were ADMINISTERED. A copy of your vet record is still required to be on file. Please submit the most up-to-date shot records for this pet. Allowed files types: jpeg, png, pdf. 5mb maximum file size. If someone other than the dog owner is picking up, they must be listed below and they MUST have a form of photo ID with them when they come to get the dog. As the guardian of the above referenced pet, I understand Friendly Paws Pet Resort and it’s employees will exercise due care to protect the health and safety of my pet while in their care for either in-home pet sitting services, or boarding at the Friendly Paws Pet Resort facility. In the event my pet becomes ill or sustains injury, I have given permission for those in charge to take whatever steps are necessary to obtain medical treatment for my pet and I agree to pay all charges incurred. I consent to any veterinarian being retained to render care for my pet. I understand the concept of my pet interacting with a dog handler, or pet sitter and as always, with the interaction of animals there is a chance of injury. I assume all risk of injury to my pet while in the hands of Friendly Paws Pet Resort or in transportation to any veterinary clinic, so long as reasonable care is taken to prevent any unnecessary injury, death, or loss. By using Friendly Paws Pet Resort and Pet Sitting Services, I agree not to file legal charges against Friendly Paws Pet Resort, or their employees for any injury, death or loss of my pet. I hereby waive and release Friendly Paws Pet Resort and it’s employees from any and all liability of any nature for any injury, death or loss of my pet resulting from Friendly Paws Pet Resort’s actions or on the grounds or surrounding area of Friendly Paws Pet Resort (or the pet owner’s home). In the unlikely event my pet causes injury to another animal or person while in the hands of Friendly Paws Pet Resort, I agree to indemnify and subrogate Friendly Paws Pet Resort from any action which may be brought against it, and for any defense, settlement or judgment against it. I will assume liability for the actions of my pet and agree to maintain personal liability insurance to cover me in the event of such an accident. In addition to the waiver above, I also agree to pay any applicable charges pertaining to excessive damage done by my dog to the external or internal property belonging to Friendly Paws Pet Resort (i.e. fencing, gates, kennel walls). 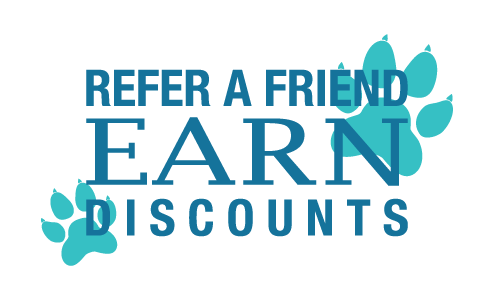 I am also aware that additional service fees may be charged for after hour and Sunday drop off and pick up, medication administering, dog bathing and any other service rendered above and beyond basic services offered at Friendly Paws Pet Resort. Group play is for dogs that interact well with other dogs. Friendly Paws Pet Resort provides sufficient staff to monitor groups of pets and screens all dogs prior to entry into group play. Any time dogs play together, there is the possibility of injury from rough play or combative behavior. We take every precaution to prevent injury, but scratches, bites and other trauma may occur, as may the transmission of parasites such as worms. Similar risks occur any time that your dog is around other animals. It is advisable to ensure that your dog is on a deworming protocol with your veterinarian. Your signature acknowledges that you are aware of the risks involved with any canine group activity, that you hold Friendly Paws Pet Resort harmless for the associated risks and are authorizing your dog to enter into group play.